Back in 2002 when I served as Director of Policy and Communications for Congressman Adam Putnam (FL-12) then Vice Chairman of the Oversight and Government Reform Committee's Subcommittee on National Security and Foreign Affairs he requested a staff report on North Korea’s nuclear program. Both North Korea and Iran seem to be using the "building block approach," by developing space boosters that could be reengineered and deployed as ballistic missiles. This approach could allow North Korea and Iran to possess a Limited Range ICBM within the next five or ten years, while retaining the option to develop a Full Range ICBM, without initially committing to such a course. In general, the performance attributed to the various missile systems appear to far exceed the performance that would be seen under real-world conditions while carrying a legitimate strategic lethal payload mass, which would not be sufficient to reach the continental United States. However, they present a legitimate lethal threat to the Europe, Asia, the Middle East, and much of Africa. The proliferation of medium-range ballistic missiles (MRBMs)--driven primarily by North Korean No Dong sales--has created an immediate, serious, and growing threat to US forces, interests, and allies, and has significantly altered the strategic balances in the Middle East and Asia. We judge that countries developing missiles view their regional concerns as one of the primary factors in tailoring their programs. They see their short- and medium-range missiles not only as deterrents but also as force-multiplying weapons of war, primarily with conventional weapons, but with options for delivering biological, chemical, and eventually nuclear weapons. The report also noted that the nuclear and missile cooperation between North Korea, Iran and Pakistan was brokered by the notorious anti-Western Pakistani nuclear weapons pioneer A.Q. Khan. As we reach the end of the 15-year window projected in our report to Congressman Putnam, the Voice of America reports that satellite images taken and analyzed by the intelligence firm Strategic Sentinel discovered a missile silo in Geumchang-ri, a mountainous area in North Pyongan province, where American intelligence believed that the country was conducting nuclear weapons research in the late 1990s. According to Strategic Sentinel, the missile silo has dimensions very similar to one known to exist in Tabriz, Iran. “If this Iranian site is housing missiles and the North Korean site that we have uncovered is the exact same dimension, then it’s quite possible that the site that we have uncovered is housing missiles as well,” explained Strategic Sentinel founder Ryan Barenklau. He also suggested that the two countries could be collaborating on nuclear research. Mr. Barenklau’s politesse is understandable, but there was no question in the intelligence we reviewed in 2002 that North Korea, Iran and also Pakistan had for many years been cooperating on missile technology and nuclear weapons research. And the evidence that cooperation has continued is overwhelming. 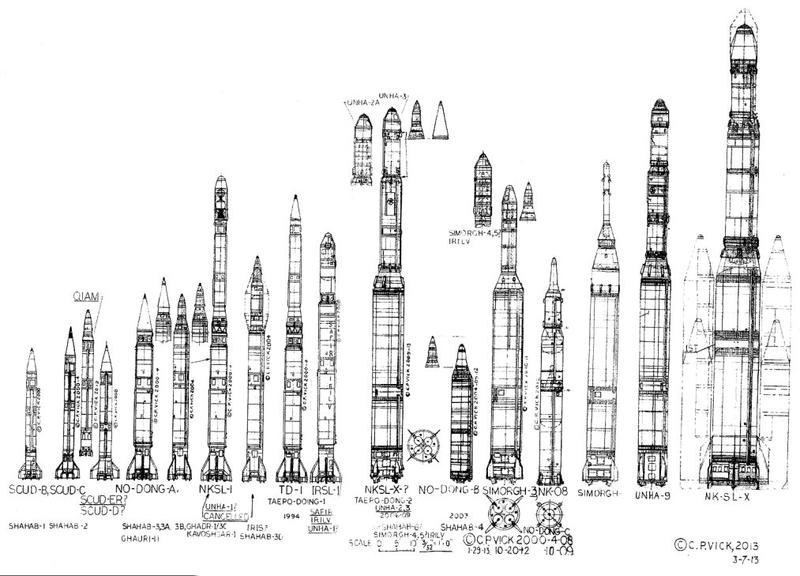 The bulk of Iranian ballistic missiles are reverse-engineered North Korean designs. You can see their parallel evolution in this illustration by globalsecurity.org. Moreover, in the January 2015 issue of The Tower Magazine, investigative journalist Claudia Rosett offered some background on the two rogue nations’ history of joint missile development. Once again, there is no question, based on our 15-year old research that Iran and North Korea – and Pakistan – have cooperated on nuclear weapons and missile technology. For many years, there has been a lack of understanding of the origin and direction of the North Korean nuclear weapons program, particularly the DPRK’s ongoing effort to develop the capability to deploy a nuclear weapon on a ballistic missile. Equally absent from public discussion and concern is the clear, high level of cooperation between the DPRK and other anti-western regimes and actors, such as A.Q. Khan the father of Pakistan’s bomb, and Iran. While this briefing focuses on the history and capabilities of the North Korean nuclear program, recognizing the relationship between Iran, North Korea and individuals associated with the Pakistani nuclear program will enhance the understanding of this strategic threat. After the North Koreans tested a nuclear weapon in last January, retired Army Maj. Gen. Robert Scales, a former commandant of the U.S. Army War College, explained in simple terms how the cooperation works today. The Axis of nuclear weapons and missile technology proliferation between North Korea, Iran and Pakistan accelerated under Obama, but has proceeded unimpeded through both Republican and Democratic administrations. This growing tripartite threat represents one of the great undiscussed strategic challenges facing the incoming Trump administration, and we here at CHQ believe it has gone undiscussed long enough. It is time that Americans know the truth about the threat and that American policymakers deal with it. Go here to view the Strategic Sentinel satellite images of the North Korean nuclear weapons and missile site.